Here’s another project from last year, but last year it was a crafting FAIL!. Let me explain. My neighbor was trimming his tree and had these beautiful branches in the front yard ready for the trash pile. So what does a crazy, DIY addict do? Asks if I can have all the branches 🙂 I grabbed a bunch and put them in with my wood stash in the garage. 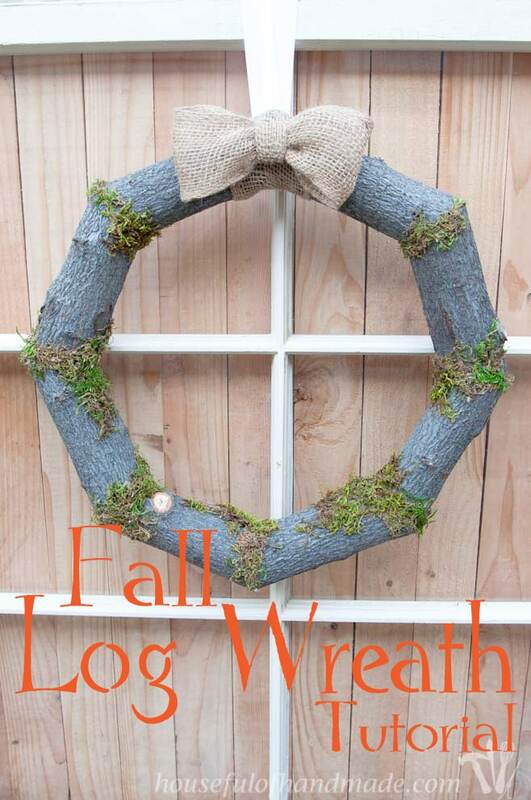 Then when fall hit, I had a brilliant idea to turn them into a wreath! So I figured out my measurements, cut out my logs, then dry fit them together. I was so excited at this point. It was going to look so good. But then I couldn’t figure out how to connect all the pieces. I obviously wanted to use wood glue, but the angles would not work with my clamps. Then I couldn’t figure out how to pre-drill and secure with screws. And last year I didn’t have a nail gun. So in a moment of brilliance (or so I thought), I used hot glue! I could hold each side together long enough for the glue to dry without any clamping necessary. I was so excited and hurried and glued it together. Then I added a little moss to make it beautiful and hung it over my fireplace. I was so proud that I had figured it out. Two days later… I was minding my own business working on the computer after everyone was in bed and CRASH!!!! Scared me half-to-death. I turned around to see my beautiful new wreath in pieces on the floor. Apparently hot glue is not suppose to hold heavy things for extended periods of time. At this time I put all the pieces in a bag and stashed it away. Not totally ready to give up on my idea, but not willing to try again anytime soon. This year I decided to try and pull out the wreath because I am now the proud owner of a nail gun! Thank you hubby, best Mother’s Day present ever. 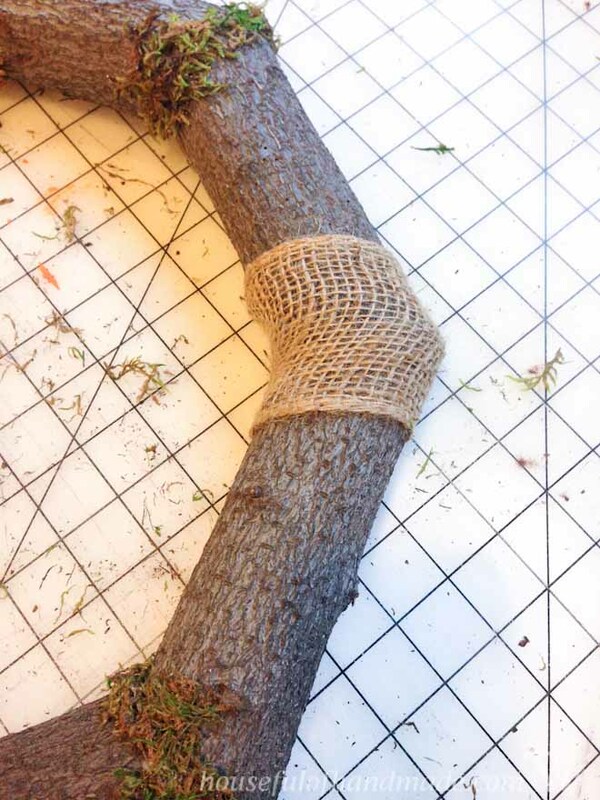 I scraped off the dried hot glue with a razor blade and using wood glue and a large amount of 2″ nails per joint, I made sure that sucker was not going to fall apart again! 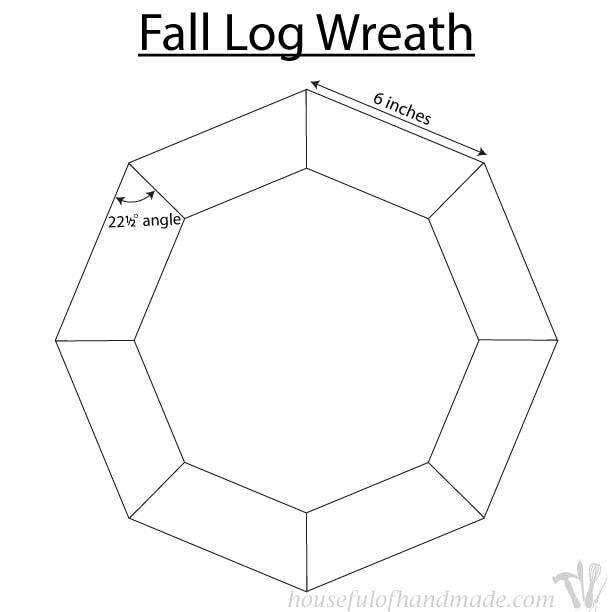 If you want to make your own log wreath, gather some wood branches about 2 to 2 1/2 inches diameter. Then cut them into 6 inch pieces with a 22 1/2 degree angle on each side angled towards each other. You need 8 of these to make a full circle. 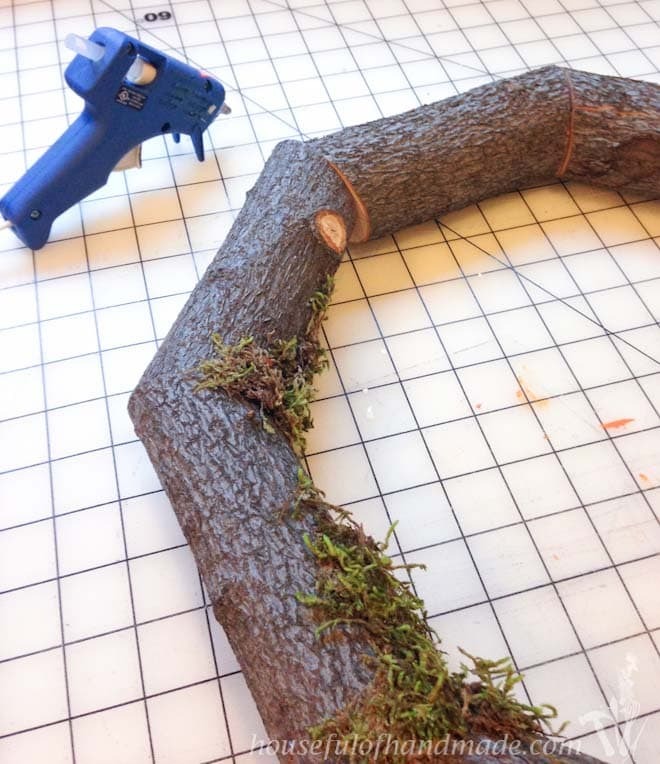 Using wood glue and a nail gun, secure those together at each corner into a circle shape. Then add some moss around the joints. You can see here that the logs are not all the exact same size and the angles were tricky because the wood is round so it can rotate slightly when cutting it on the miter saw. I just kept adding in moss until all the seams were hidden (except the very top one that I was going to hang it from) and I liked the way it looked. 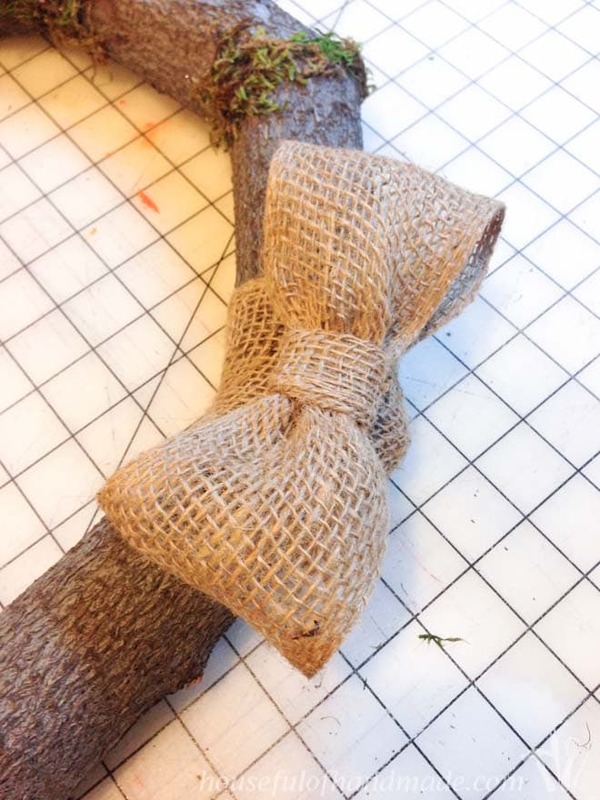 Once it was all pretty, I wrapped the top joint with a piece of burlap ribbon to cover it up. I secured it with some more hot glue. Then I made a simple bow and glued it to the front. I just love how it looks so woodsy! Perfect for fall. I found this beautiful old window to hang over the mantle with the wreath. I can’t wait to get it all put together. Oh Wow, that is really nice! Very creative! 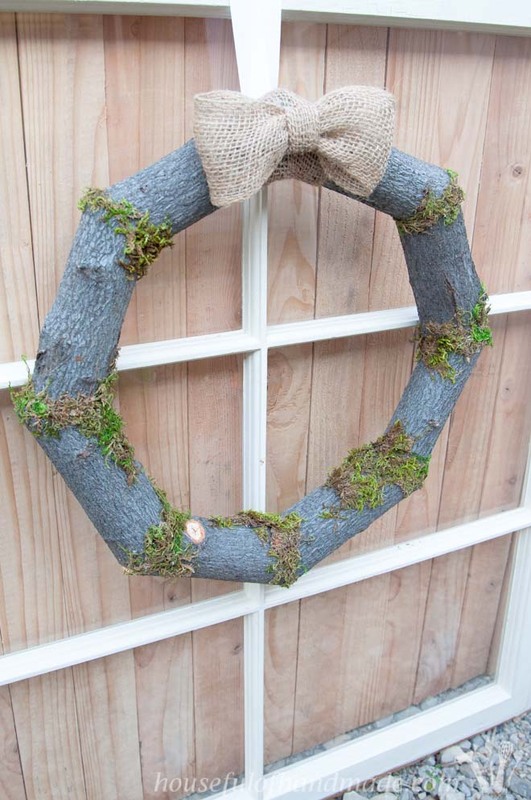 I never would of thought of using branches for making a wreath. Love it! You did a great job! Thanks so much Linda! I love that the branches came out of the yard, but look so amazing as a wreath. Thanks Lisa. I’m really glad I kept up with it too, sometimes persistence really pays off. Oh, my I LOVE this wreath!! So glad you kept going with the idea. We’ve all had those moments where the idea in our head just would not get to the “completed” phase the first or second try! The moss really adds a pretty touch. 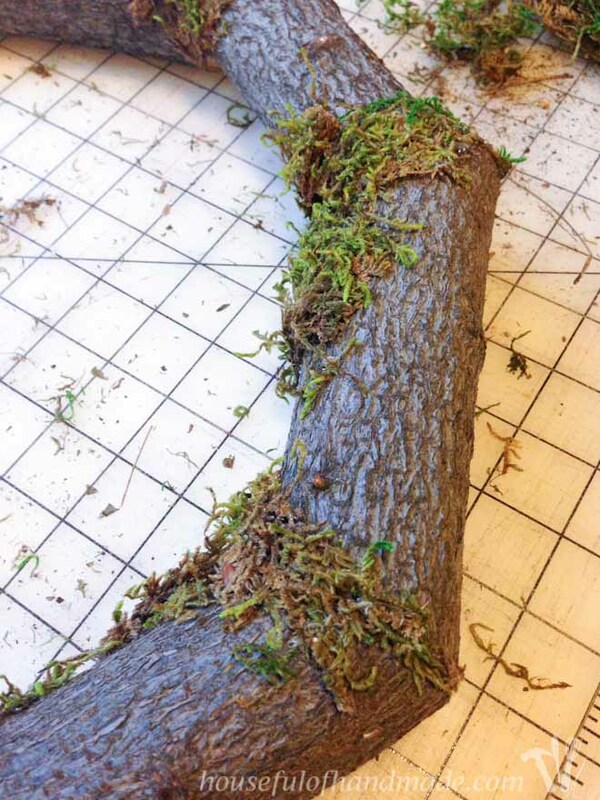 Lichen would also look pretty….hmmmmm… the possibilities! Thanks Catherine. 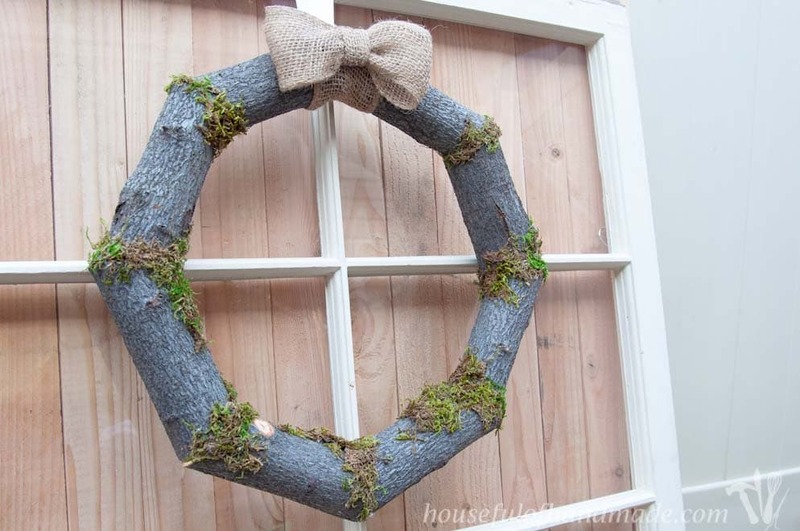 I have never used Lichens but they would look so nice on this wreath too. I remember this wreath from last year. I have had several projects that have met their demise shortly after making them lol. Glad the nail gun came to the rescue this year! Thanks so much Amanda! I hate when a project doesn’t last, but luckily this one was easily saved. I love your log wreath! 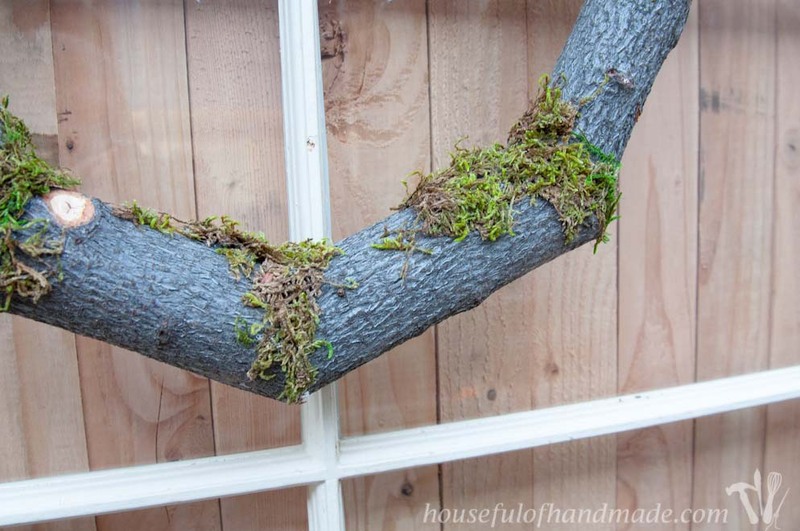 I’ll be looking for some branches to cut into pieces to make one of these. What creativity – you are truly blessed, and we are in return for your sharing with us! Happy Fall! Thanks for your sweet words! I hope you can find some branches. I love that I could make it out of found items, free crafts are the best! This wreath looks great! Thanks so much for sharing it at Totally Terrific Tuesday this week. I want to make one of these, now! Thanks Christie. 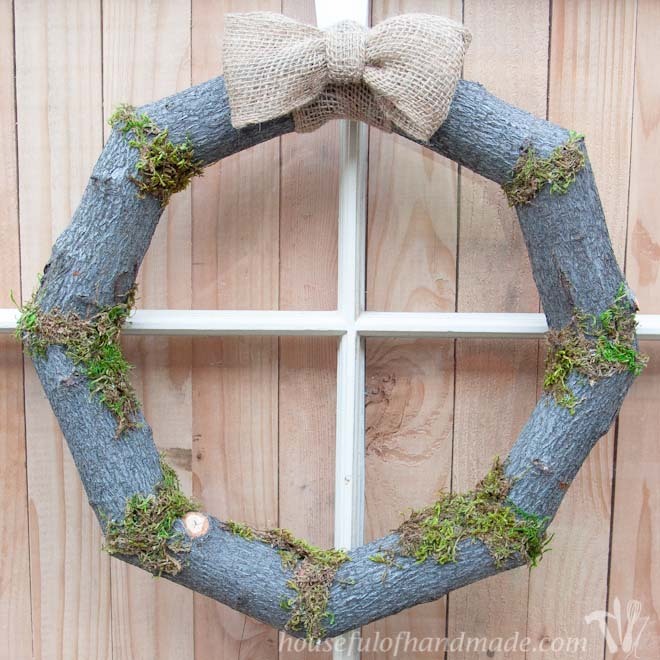 It’s a fun wreath to make, I hope you try it! What a great idea! I love the moss you’ve put on the seams, too. Thanks Megin! 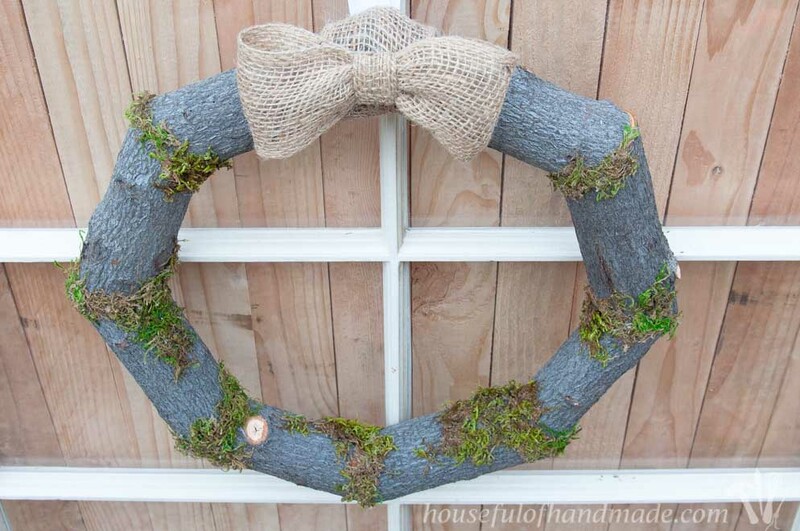 Isn’t it funny how adding the moss to cover the seams made all the difference in the wreath! This is awesome! Love the moss! Thank you for sharing your project with us at Brag About It! I love it! It’s very fall-ish without being bright orange, which is a win in my book! 🙂 I have a window hanging in my dining room like that, and I love displaying wreaths there. 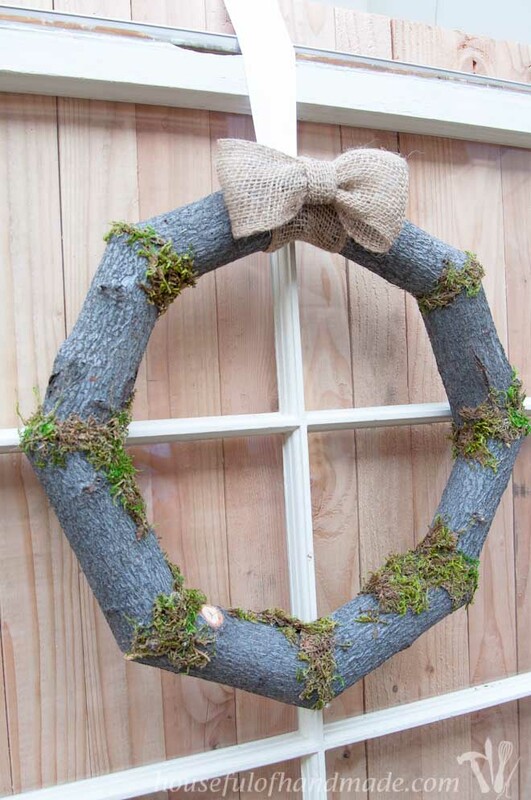 Your wreath is so cute and unique! I love those kind of projects! We would love to have you stop by and share this at our Dream. Create. Inspire. Link! Party. It goes live tomorrow at 7pm CST. Thanks for an awesome project! Thank you Cat! I will definitely come check out your link party. Thanks Sherry. I just love it when an idea works out! 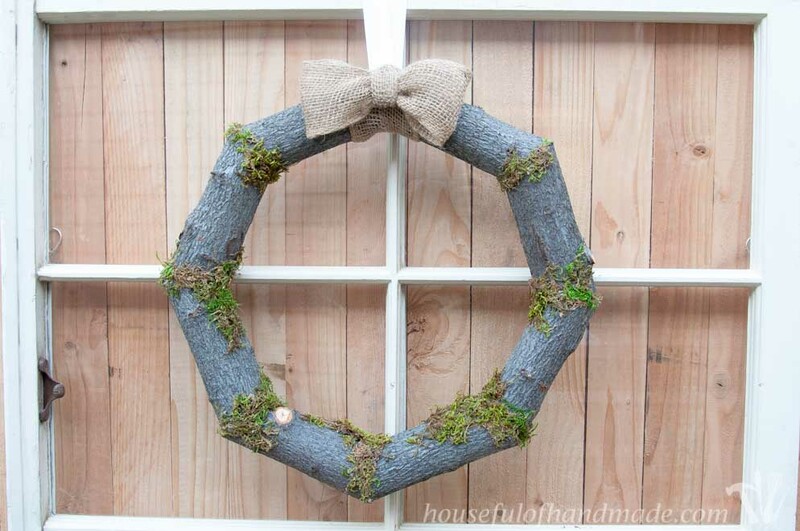 I LOVE this wreath idea! You could add some great festive elements to it for the holidays too. Brilliant! PS My weekly Sundays Down Under linky party is on now and this would be a wonderful addition-please pop by and say g’day if you have a moment! Thanks so much Natasha! You could definitely use this with holiday decor, or even some cute butterflies for spring. I just popped by to say thank you for sharing your projects at the Sundays Down Under linky party! Hope you can link up again this weekend. Thanks Gina! I had to do some serious math to figure it out, but eventually I got it to work 🙂 I’m glad it’s helpful. Hi, Kati ~ I’m so glad you persevered and figured this project out! It’s gorgeous! I love the way the moss looks, and it’s such a unique shape! So cool! I really want to make one! Thanks for the inspiration! This is the cutest idea! This would be adorable in the garden and I have hundreds of logs laying around 🙂 Love it! I wish I had hundreds of logs, I have lots more fun ideas and inspiration to use them, but I had to bum them off my neighbor. It would definitely look awesome in a garden, I thought about adding some mushrooms to the moss too, but couldn’t find any I really liked. Hi Kati… Found you via chemistry cachet’s IG account. 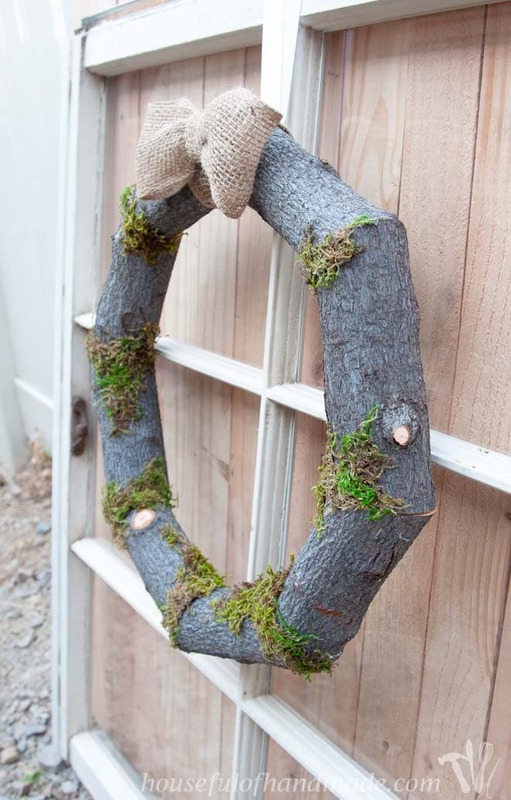 This log wreath is wonderful! I would have heart attack if it crashed in my house… Glad you were able to secure it. Looking forward to reading your other posts… Thanks!